The Unicorn gallops across his wild domain, confident in his security. No evil creature can approach him, and hungry wild animals are too wise to consider him prey. He only stops to socialize with the gentle fey of the forest. In exchanfe for their friendship, the Unicorn approaches their wounded and ill, and touches them with his horn, which glows with healing light. This one's a pretty tough creature, considering it's thought of as pretty girly. If you're a typical party, you're more likely to find yourself allied with it that against it. And if you're an evil party you're going to have a difficult time catching it, because it'll sense you before you notice it and teleport to some other part of the forest. Picture requested by a user of the Giant In The Playground forums. 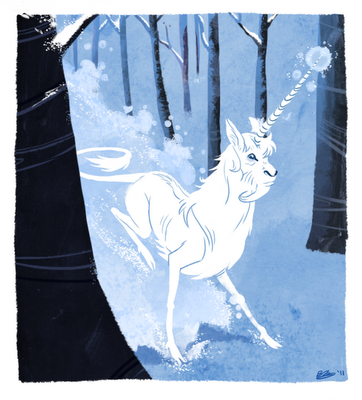 I like the idea that the original idea for the unicorn came from mutations that happen naturally in nature, for example albino deer, or one-horned goats and bucks. Wonderful work!! I really love how you drew the tail, very classical. You don't see many unicorn drawings these days with the beard, either (since unicorns are more like goats than horses, I believe.) Really beautiful illustration! It's so hard to draw something as widely known as a unicorn and make it look distinct like this, really good. Lovely illustration. BBC Radio 4 had a fascinating piece about the history of unicorns. You can listen again online.